Tom is the tuner/technician, owner, manager, sweeper, etc., at Roby's Piano Shop. Tom is a Registered Piano Technician (RPT) with the Piano Technicians Guild. That means he has passed examinations in tuning and repair skills, and adheres to the PTG code of Ethics. This means you can be more comfortable because he really does try to make his goal: skill, integrity, and service. In his prior incarnation, Tom was a mechanical engineer working for the Eveready flashlight plant in St. Albans, VT. After 16 years of successful designing, building, project managing, and production trouble-shooting of various production machinery, Tom chose a different path. His love of music and mechanics blended into this wonderful new career. In 1975 Tom started working on pianos part-time. In '79 he opened Roby's Piano Shop in downtown St. Albans, VT selling new and used pianos and music full time. He still sells a few used pianos, but from his home, by appointment, and does not sell music. 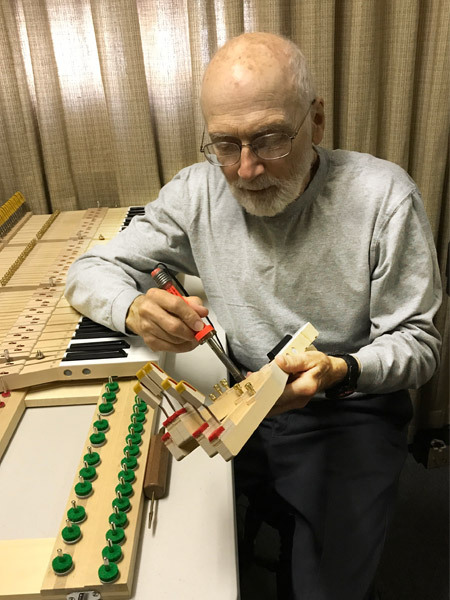 During the 80s and 90s, Tom was contract piano technican for State University of New York at Plattsburgh for 19 years, and also for Johnson State College in Johnson, VT. Tom was technician for lots of schools, churches, and homes of teachers, students and avocational pianists. In 2010, Tom sold his home service business to Chris Rawson in Plattsburgh, NY. in 2017 Tom fully retired. © Copyright 2019 by Roby's Piano Shop. All rights reserved.